Review by AllTheBestFights.com: 2016-11-12, good fight between Danny Garcia and Samuel Vargas: it gets three stars. The undefeated former Wba, Wbc light-Ww and current Wbc Ww champion Danny Garcia entered this fight with a perfect boxing record of 32-0-0 (18 knockouts) and he is ranked as the No.3 welterweight in the world (currently the #1 in this division is Manny Pacquiao). In his last two bouts he has beat Paul Malignaggi (=Garcia vs Malignaggi) and Robert Guerrero (=Garcia vs Guerrero). His opponent, Samuel Vargas, has an official record of 25-2-1 (13 knockouts) and he entered as the No.39 super welterweight. He lost to Errol Spence Jr last year but then he has won five consecutive fights beating Edgar Ortega and Juan Armando Garcia. 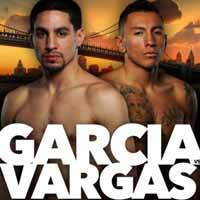 ‘Swift’ Garcia vs Vargas is the main event of the evening. Watch the video and rate this fight!